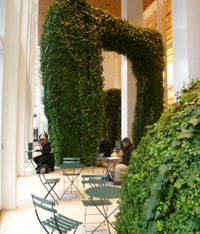 They’re whimsical and imaginative, artful and sculptural…topiary gardens take many shapes and sizes. The precisely sheared shrubs and trees seem to come to life. Recently though, topiary gardening has morphed into something even more magical: Mosaiculture. These public works of horticultural art, often several stories high, encompass wire frames that act as colossal planters filled with potting mix, thousands of colorful plants, and sometimes even irrigation systems…these are the divas of the plant world. 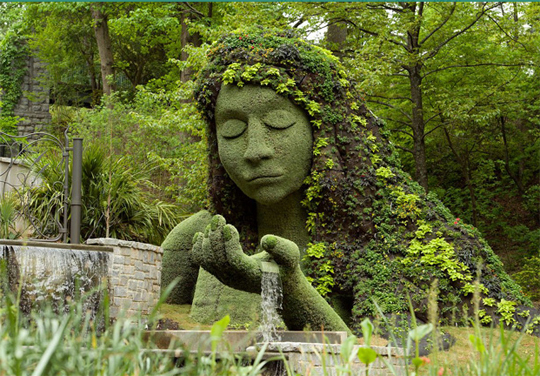 The Atlanta Botanical Garden, Atlanta, GA: Their Imaginary Worlds exhibit is “a menagerie of magical creatures that casts an enchanting spell over the Garden with 28 monumental living sculptures of fantasy and delight”. This first Mosaiculture exhibit in the United States will be on view until Halloween. 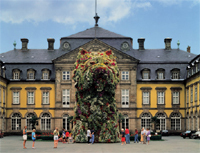 Sculptor Jeff Koons‘ 40-foot tall “Puppy” is composed of stainless steel, tons of soil, geotextile fabric, an internal irrigation system, and tens of thousands live flowering plants. This pup is a world traveler too, with the Guggenheim museum in Bilbao, Spain now serving as its permanent home. See more of the artist’s work here. Some of the tough plants used in Mosaiculture include perennials: Carex, sedum, creeping thyme, oregano, dichondra, santolina, echeveria, iresine and alternanthera. Colorful annuals include: zinnia, impatiens, bidens, daisies and scaevola. Learn more about Mosaiculture from the Montreal, Canada nonprofit organization that conjured up this amazing concept. Green Animals Topiary Garden, Portsmouth, Rhode Island: The Preservation Society of Newport County now cares for the former Brayton estate. What self-sufficient farm would be complete without its very own topiary garden? The whimsical garden features 80 living sculptures created over much of the 20th century. 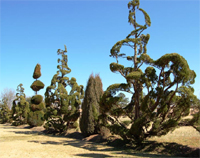 Some of the shrubs and trees used in traditional topiary gardens include: yews, boxwood, privet, holly and juniper.